Fear the change. Smell the blood. Ricardo Cuaron has been on the run for over 100 years, cursed with immortality and damned by the blood of a shapeshifter. He’s tried to find a place to hide and rest. He’s tried to forgive himself for his past. But the past is relentless … just like the monster devouring Ricardo from the inside out. Behind Ricardo is Tomas Morales: a father who lost a child, who will never stop short of vengeance — even if it costs his soul to find it. Tomas was once a man, like Ricardo. But he’s a man no longer, and he will never stop coming. Ricardo’s only hope for salvation is to find the woman who helped him once, who helped him in turn when he needed it most. But Penelope Miller has secrets of her own … and now there’s a new hunter on the trail, eager to capture them both. Is there an end for Ricardo, be it in Heaven or Hell? Or is there only the sameness of everyday that he’s been plodding for a century … an unrelenting march of horror? 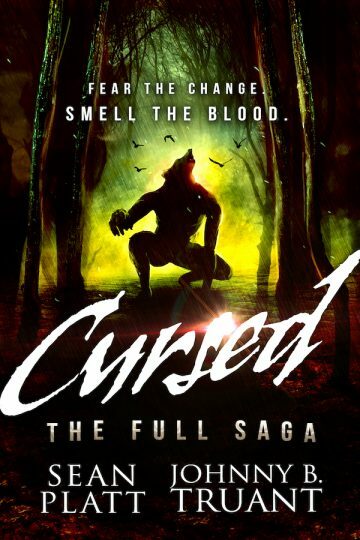 Cursed is an epic 9-book series, now available in this complete omnibus. Birthed from the inquisitive minds of Platt & Truant (authors of the Invasion series and The Beam), you’ve never met a cast of terrors quite like this.